McCalls 6173: 3 variations of Leggings: View A has waistband, mock fly front zipper & exposed zippers @ hem ; View B has elastic waist & View C has longer length for ruching @ the ankle. I did View C, which is one piece and a piece of cake to sew. 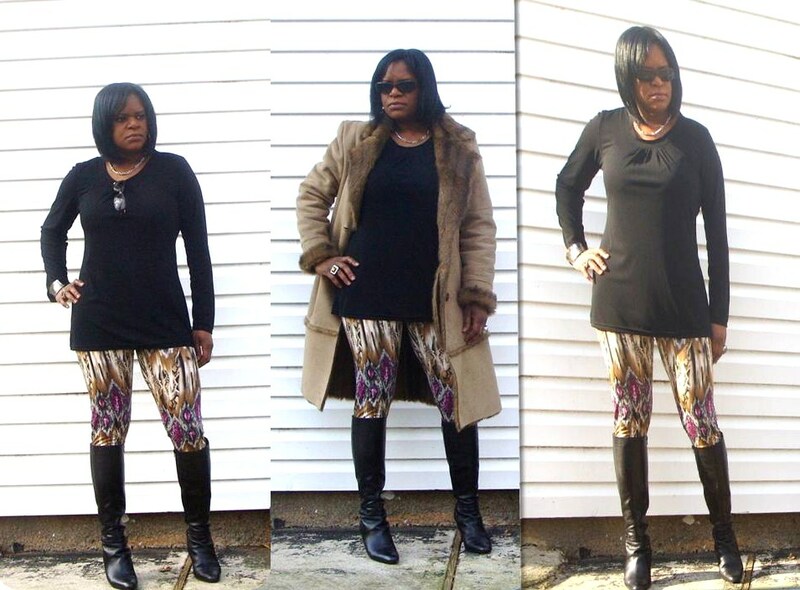 I must admit leggings were never really a part of my wardrobe, I only have 2 pair that belonged to my daughter and basically wore around the house or for exercising & dared not wear them outside. Recently, I took stock of my weekend wear and realized, I really don't have one, for the most part my weekend wear is my causal Friday garments... cardigan, slacks/jeans and a fitted tee... ummm yeah. During several conversations with my sewing sisters, Cennetta, Rachel , Andrea, Alethia & Faye, the topic of leggings came up and we further discussed how they would be perfect for this time of year and pairing with a tunic or long sweater for a funky fun weekend look. I couldn't go wrong with all the inspiration and decided I needed leggings in my life. For my first pair, I used black embossed 2-way stretch faux leather from JoAnns @ 14.00/yd, luckily I had a gift card, so it was painless to pay that amount. The pattern runs big and suggest one go down a size. Once the leggings were sewn, there was bagging along the legs. Returned to the serger and removed 1/2" from the inseam, tried on again then removed another 1/4"and the fit was better. After tweaking the pattern piece, I was raring to go. Matter of fact there is a Youtube tutorial for McCall 6173 by Secret Life of A BioNerd. Cute video. Seriously, I didn't make all the markings noted on the pattern piece, just made sure to mark which side was the back and off I went. For the waist I used no-roll elastic, serged to the right side of the fabric and flip to the inside and folding once again, then zigged-zagged stitched. For the legging hem, I used the coverstitch and presto... finish. I have several lycra knit prints that after purchasing sometime ago realized the print wasn't what I would wear for a dress, and were quickly earmarked for leggings. Nothing like wacky leggings for weekend wear. So over the course of the New Year holiday, I made 7 leggings. The pattern is seriously addictive and totally gratifying. Of course, of the 7, my sister took 2 of them, and have 2 more to make for my daughter. Hence, the making of my lot of leggings... to top it off, I actually put my big girl socks and ventured out of the house with the outfit below and paired it with Simplicity 2850. Sheesh, who would have thunk it... the outfit was super comfy, warm & wicked. Until then Everyone Have A Beautiful week. Hot cha cha cha. Fancy leggings you got there. Very nice and a very comfortable weekend look. Nice job. Those wacky leggings are really cool! Those look awesome. The last pair is truly inspirational! I agree that patterns runs big--crazy big! Yeah, those leggings are great. I think I want to make some, but I'm a little overwhelmed by trying to figure out what kind of knit to use. Still not comfortable with knits. Great job. I have not worked up the nerve to wear leggings. You look very nice in yours. Love the boots, I have some that are similar. Awesome. I am so making leggings now that I've seen yours! Girl, you in the leggings = a great look! Those are some great looking leggings. Nice! that's a great look on you. I know these outfits were really comfortable especially on the weekends went you need comfortable but cute clothing to run around and do errands. And they are very much in style. You'll enjoy your leggings. Comfy and warm. I love you in these looks Ms. Sheila! You and your sewing sisters were so right! Awesome! I've been living in leggings on the weekends recently - so comfy and easy. Yours are fantastic! Hot stuff - starting the new year just right! Sheila,I want to make these pants out of a stretch faux leather that I have...it's maybe a two-way stretch. In your opinion does this pattern call for a moderate stretch or more? I have got to say, I think my favorites are those last ones! LOVE the print! Lord, love a legging. Adelaide, the fabric suggestion is stretch knits, cotton stretch, double knit... Go for it. Alethia, I think a moderate stretch would work, making sure the stretch goes width wise. The pattern sizing runs big, and noticed that using a cotton/lycra stretch meant going down a size or two, but think that would not be the case with a moderate stretch, just cut true size. the leggings fit your great, very nice!! Great job. I love that print leggings most. You have raised the bar! I gotta try leggings now. So cool! Well, well, Ms. Sheila. I love those funky leggings. Lookin' fabulous in your new weekend gear. Seven pair. Wow! You did good girl. WOW! girl you are sooo rocking those leggings. Awesomeeeee! Wow ! Now she's making leggings ! Go Lady ! I love them and especially with the boots. I'm really feeling those printed one too. I would so buy those out of the store.